Located in the inner ear are several small organs responsible for balance. These organs belong to the vestibular system and give humans and many other mammals a sense of spatial awareness. The otolithic organs; the utricle and the saccule – Involved in detecting linear (forward and back or up and down) motions. As mentioned above, the otolith organs comprise of the utricle and saccule, these are simply cavities which form part of the labyrinth of the inner ear. They contain hair cells and otoliths which send signals to the brain concerning the orientation of the head. The hair cells of the utricle and saccule project into a gel like material. Within this gel lie many small calcareous structures – otoliths. Their function is to detect motion, which they do by movement. When the head is tilted the otoliths move and press onto the hairs protruding into the gel like substance. The hair cells are receptors which send sensory information to the brain, signalling the orientation of the head when stimulated by the otoliths. The orientation of the utricle makes it sensitive to horizontal movement and acceleration (e.g. accelerating in a car) whilst the saccule is sensitive to vertical movement and acceleration (e.g. accelerating in an elevator). The signals received from the sensory hairs can cause corrective motor movement of the posture or eyes, which helps to keep the animal balanced. The semicircular canals of the inner ear are arranged over 3 spatial planes (x,y and z) to detect rotational movement across all 3 axis. At the base of all three canals lies a cluster of sensory hair cells (as found in the saccule and utricle). In a similar manner to the otolithic organs, the hair cells project into a gel, however the gel only forms a cap over the hairs – the rest of the canal is filled with fluid. The gelatinous cap is called a cupula. Rotational movement causes the fluid in the semicircular canals to flow, this in turn pushes on the cupula which stimulates the hair cell receptors embedded within. The stimulation of the hair cells causes impulses to be sent to the brain by sensory neurones alerting the brain that the body is engaged in angular motion. Sensory information from the vestibular system is detected by the vestibular nuclei via the vestibular nerve (one half of the vestibulocochlear nerve VIII). The pinna – This is the funnel shaped cartilage on the external surface of the ear, it helps to guide sound waves into the ear drum. It leads directly to the external auditory canal/ external auditory meatus. 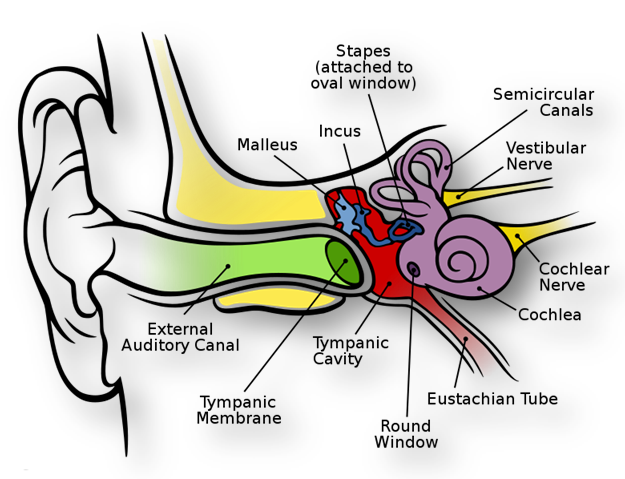 The external auditory meatus – Acts as a canal for the sound waves, carrying them to the tympanic membrane (ear drum). The tympanic cavity – An air filled cavity, lined with a ciliated columnar mucous membrane which opens out into the Eustachian tube. The tympanic membrane – Commonly known as the ear drum, they provide a boundary between the external and middle ear. The membrane is thin which allows it to convey sound waves (vibrations) to the auditory ossicles. The bony labyrinth – Consisting of the bony cochlea, bony vestibule and the bony semicircular canals. They contain perilymph which flows around the outside of the membranous labyrinth. Oval Window – A thin membrane which links the bony labyrinth to the middle ear, the stapes transmits vibrations to the oval window, these vibrations are carried to the cochlea. Round Window – Allows the release of pressure formed by sound waves transmitted to the cochlea by the oval window. Also dissipates sound waves, to prevent the prolonged sensation of a sound due to sound waves reverberating in the ear. 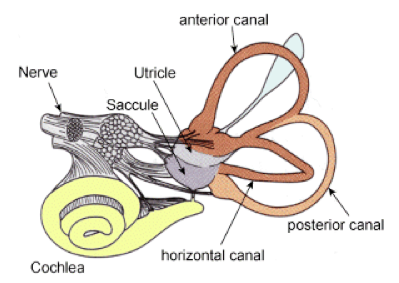 Membranous cochlea – A spiral shaped tube filled with endolymph that contains sensory receptor cells which detect sound. At the end of each receptor is a sensory hair, the nerve fibres from these hairs go on to contribute towards the vestibulocochlear nerve (VII). Membranous vestibule – Connects with the cochlea and semicircular canals, it contains specialised sensory receptors involved in balance when still. Membranous semicircular canals – Three endolymph filled canals containing sensory receptors involved in balance when moving. The cochlea (the spiral, snail shaped structure of the inner ear) is responsible for detecting sound and allowing it to be perceived with volume and frequency. The cochlea has two large perilymph filled canals, an upper and a lower canal, separated by a small endolymph filled cochlea duct which runs almost the entire length of the cochlea. The upper canal is known as the vestibular canal and the lower canal is known as the tympanic canal. The floor of the endolymph filled cochlea duct (basilar membrane) houses the organ of Corti. This organ contains hair cells which project into the cochlea duct. The hair cells act as mechanoreceptors and detect sound wave vibrations. The hairs are able to do this because sound waves entering the cochlea cause the basilar membrane of the cochlea duct to vibrate. As a result, the hairs bend and because they are mechanoreceptors, they are able to initiate action potentials by depolarisation. Each hair cell contains a bundle of ‘hairs’ which project from its surface. Vibration of the basilar membrane moves the hairs, causing them to bend against the surrounding fluid and the tectorial membrane. The tectorial membrane is a membrane which lies just above the hairs of the hair cell and remains fixed in that position. The process of perceiving sound is as follows; sound waves which have entered the ear eventually reach the stapes. The stapes vibrates on the oval window which produces a pressure wave in the perilymph of the upper vestibular canal. This pressure wave travels along the vestibular canal to the ‘apex’ (tip) of the cochlea duct. The cochlea duct ends just before the apex, allowing the pressure wave to travel back the way it came to the round window except by means of the tympanic (lower) canal. The energy of these pressure waves causes the basilar membrane of the cochlea duct to vibrate, stimulating the hair cells. Fish have no outer ears, only inner ears with no direct fluid connection to their environment. This is due to the easier detection of sound pressure waves in a water environment. Instead, fish have neuromast receptors running along their lateral lines each of which is composed of a group of hair cells. The hairs are surrounded by a protruding jelly-like cupula. The hair cells in the lateral line are similar to the hair cells inside the vertebrate inner ear, suggesting that the lateral line and the inner ear share a common origin. Amphibians/ reptiles have a more familiar hearing system when compared to mammals, although again they have no outer ear they do have the middle and inner ear. They have an exposed tympanic membrane, from here the pathway continues very similar to mammals, via the small bones into fluid filled channels in the inner ear. The ear is able to distinguish between different frequencies of sound. Similar to wavelengths of electromagnetic scale (e.g. visible light), sound waves also have different variations in frequencies. In terms of audible sounds, the lowest (infra) sound detectable is 10Hz (1Hz being one vibration a second). This is an infrasound meaning it is not detectable by humans. Elephants however are able to hear sounds at this very low frequency. On the opposite end of the scale (ultrasound), bats are able to hear sounds with as high a frequency as 100kHz. To put things in to perspective, a humans hearing range is 20Hz – 20kHz. The ear is able to detect these different frequencies due to an adaptation by the cochlea. The basilar membrane of the cochlea duct varies in stiffness and thickness. The result is that different frequencies of pressure waves cause different parts of the basilar membrane to vibrate; this therefore stimulates different hair cells. High pitch sounds (e.g. 18kHz) are detected near the stiff, thin base of the basilar membrane (near the oval window) and low pitch frequencies (e.g. 1kHz) are detected near the loose, thick end of the basilar membrane (near the apex of the cochlea duct). Because of the way the basilar membrane vibrates, nerves which transmit the raw sound wave information to the brain each have their own characteristic frequency – the frequency at which they generate action potentials most frequently. These afferent nerves are located along the length of the cochlea – nerves located near the apex will have a characteristic frequency (the frequency at which action potentials are generated most readily) which is low (e.g. 1kHz) whereas nerves located near the oval window will have much higher characteristic frequencies. There are two problems with this however. It is difficult for the basilar membrane to vibrate at very low frequencies e.g. 10Hz, if the basilar membrane is not vibrating then the hairs do not detect movement and the nerves are not stimulated – no sound. On the opposite end of the scale, very high frequencies cause vibrations so fast the neurones are not able to generate action potentials fast enough to keep up. A process called phase-locking helps to detect the lower frequencies. This is where groups of neurones instead of generating action potentials as normal, they generate them at the frequency of the sound wave. For example, a 60Hz sound wave will cause a group of neurones to fire 60 times in a second. At higher frequencies, when the nerves simply cannot fire fast to phase lock (e.g. 100kHz) the brain is able to simply detect that the very thinnest part of the basilar membrane is vibrating and interpret this as a sound. This is known as tonotopy. Volume is also determined by the hair cell mechanoreceptors. In terms of waves, a louder sound has greater amplitude (height) but the same frequency (cycles per second). This is mimicked along the basilar membrane of the cochlea, louder sounds cause greater vibration of the membrane – making it rise and fall with greater height. The greater displacement of the membrane causes the hairs of the hair cells to brush against the tectorial membrane more vigorously. This generates more action potentials in the sensory neurones as the brain perceives a louder sound. As you know, sound waves are ultimately detected by the hairs of the mechanoreceptor hair cells. The bending of the hairs must be converted into the generation of action potentials by sensory neurones which synapse with the hair cells before the information can be processed in the brain. When a sound wave causes a certain part of the basilar membrane to vibrate (location depending on its frequency) the hairs bend against the tectorial membrane. As they bend mechanoreceptors cause ion channels in the hair cells to open/close depending on which direction they bend. The initial direction of bending (stimulus applied) opens the ion channels causing an influx of ions and depolarisation of the mechanoreceptor. 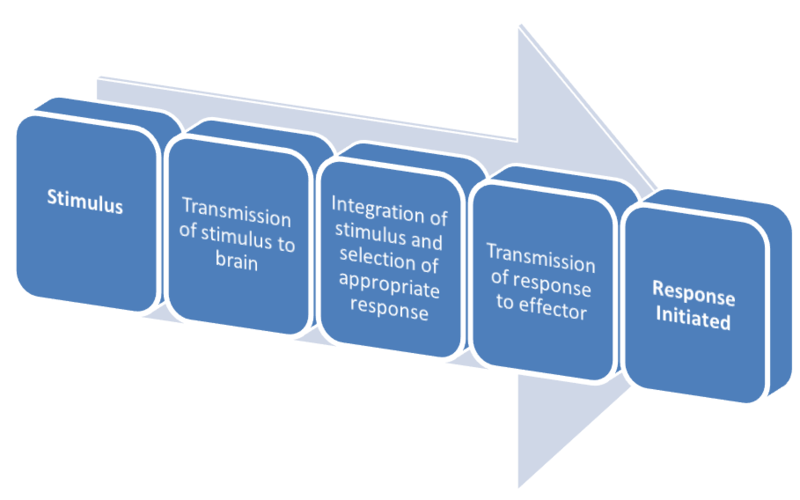 The depolarisation causes an increase in the amount of neurotransmitter released across the synapse with sensory neurone. This in turn increases the frequency at which the sensory neurones generate action potentials. As the hairs bend the other way (stimulus removed), the ion channels close. The closure of the ion channels causes the hair cell to hyperpolarise. This reduces the amount of neurotransmitter released by the cell and the synapsing sensory neurone reduces the frequency at which action potentials are generated. The auditory pathway shows how sound waves are eventually processed by the brain. So far we have discussed from the sound entering the cochlea (via the external auditory canal) to hair cells of the organ of Corti. 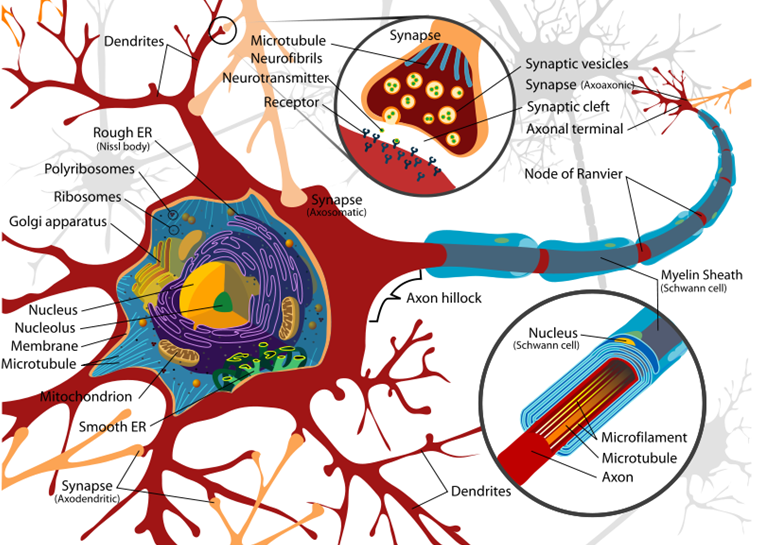 From the hair cells, the majority of information travels along large, fast, myelinated nerves. The axons of these nerves join together and form the auditory nerve (part of the vestibulocochlear nerve [VII]). The auditory nerve initially travels through the cochlear nuclei; one nucleus located both dorsally and laterally. Information from either ear remains separate at this stage. The lateral lemniscus is a tract of axons in the brainstem that carries information about sound from the cochlear nucleus to various brainstem nuclei and ultimately the inferior/caudal colliculus of the midbrain. The inferior colliculus is the principal midbrain nucleus of the auditory pathway and receives input from several more peripheral brainstem nuclei in the auditory pathway, as well as inputs from the auditory cortex. It is here that sound location data from different areas becomes integrated, allowing sound direction/ distance to be interpreted. Time delay – If a sound arrives at one ear first, this is recognised in the inferior colliculus. Volume Differences – Subtle differences in the volume of a sound at each ear also help to place a sound. The Medial Geniculate Nucleus is part of the auditory thalamus and is what finally connects the inferior colliculus to the auditory cortex. It is involved in the tonotopic organisation of sound information, as well as the detection of relative intensity and duration of a sound. The primary auditory cortex is the region of the brain that is responsible for processing of auditory information. It is located on the temporal lobe, and performs the basics of hearing; pitch and volume. The auditory cortex is involved in tasks such as identifying and segregating auditory “objects” and identifying the location of a sound in space.